Your business may be greener than you think! Complete our checklist and find out. Recycling, conservation, water conservation, local purchasing and promoting green practices all show your commitment to a sustainable community. Complete the assessment form and return it to the GVCC. If you check off at least 25 of these items, you are eligible to be certified as a "Sustainable Eco-Friendly" business! 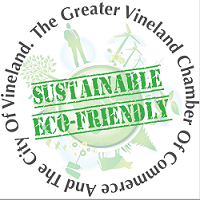 We have joined together in partnership with the City of Vineland under their Sustainable Jersey program, and Citizens United to Protect Maurice River to encourage and support businesses that are making efforts to be green.